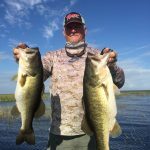 The last couple of weeks on Lake Okeechobee the fishing has been fantastic. You can go almost anywhere and catch fish. The past weeks the winds have been primarily from the South East to South West any where from 5 – 15 mph. The water clarity through out the lake is good and the water temps are in the low 80’s now. The best bite is top waters baits, cast it over the holes in the grass and work it slow and a Spinnerbait has been good too. The bait color seems not to matter. The Senko bite is doing well when the fish are not as active. Good areas to fish are the Pass , Kings Bar, 3rd point , Tin House and the Lakeport area of the lake. Here is a picture of me with a couple of fish I caught this week.